A State of Mind: Too stupid to think? Sometimes it seems like politicians spend their days doing little more than trying to pull the wool over our eyes. "The public are uninformed and disengaged - I can spout any nonsense I like and those that notice will probably believe it." No doubt you have your own view as to whether that is a fair comment - but some days it's hard to believe anything else. John Robertson as his finest. 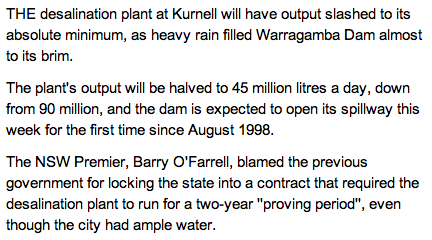 The desalination plant was built by Labor. Opinions will differ as to whether it was an essential investment in Sydney's water security, or an extravagant boondoggle, but that's not what I want to write about. What I want to write about is Robertson's suggestion that consideration to the plant being shut down. The Labor government signed a contract that, amongst other things, required that the plant run at full capacity for a two year period. If the plant was not run for the full two year period, then it appears that the government essentially "voids the warrantee" and will be responsible for any problems with the plant. I'm no engineer, so I can't give an opinion as to whether that was a good idea or not, but it was the contract that Labor signed. The "90 million litres a day" is already reduced from the full capacity of the plant, which is some 90 billion litres per year, three times the present production. It goes without saying that Robertson knew very well why the plant cannot be switched off. He wasn't in parliament when the decision was made, but his predecessors were, and to try and suggest that the Coalition should be investigating shutting the plant down is downright ridiculous. Will the public be fooled? Probably not, because O'Farrell gave the media a handy quote about the contract that was signed by Labor being "stupid". This blogpost is delayed by a day because I couldn't track down confirmation of Robertson's quote yesterday - it may be that someone in Labor was smart enough to shut down the line of argument. But it goes to show a certain arrogance, and maybe even a belief (misguided or not) that the media is too stupid or lazy to point this kind of lazy argument out. In the event, it doesn't appear that the media picked up on the comment - so the people listening to 2SM would have heard the comment entirely unchallenged. Hopefully most of them were too smart to believe it.